[S153] Chapman Advertiser, October 25, 1945, page 1, column 5 and 6. [S378] Charlotte Shaffer, "Re: Pictures," e-mail to Julia Langel, February 10, 2000. [S35] 1900 U. S. Census, Kansas City, MO, Kansas, Smith Center. 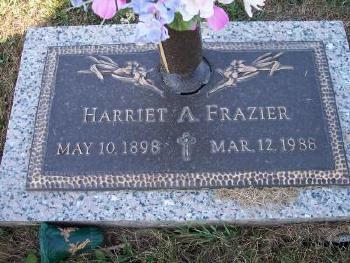 [S1613] Harriet Frazier Cemetery Marker, unknown repository, unknown repository address. 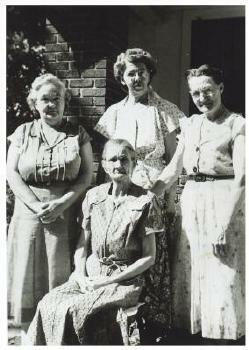 [S35] 1900 U. S. Census, Kansas City, MO, Kansas, Smith Center, James Hays household. [S34] 1910 U. S. Census, unknown cd2, Kansas, Smith County. [S28] The Chapman Advertiser, April 22, 1954, page 1, Page 1, Column 6. [S33] 1920 KS Census, Hays, James , Microfilm T625, Roll 530, Kansas, Dickinson County, Chapman, ED 50, Sheet 11A, Line 42, (James Hays household). [S462] Smith County Pioneer, n.29, March 17, 1938, page 1. [S455] News Clipping, Frazier, Harriet illness , page 1, column 5. [S462] Smith County Pioneer, n.29, March 17, 1938, page 1, page 1, column 3. [S152] Chapman Advertiser, October 18, 1945, page 1, column 5. [S24] Salina Journal, December 6, 1945. [S551] News clipping, Harriet Frazier, January 14, 1954, page 5, column 3. [S28] The Chapman Advertiser, April 22, 1954, page 1. [S856] Harriet A. Frazier, no. 513-40-7653, Social Security Death Index, RootsWeb. [S1609] Teresa Hoskins Williams, "Re: Louella Hays and Harriet Frazier," e-mail to Julia Langel, September 15, 2005, Re: Louella Hays and Harriet Frazier. 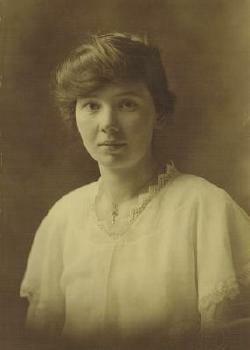 [S1609] Teresa Hoskins Williams, "RE: Some Hays Photos," e-mail to Julia Langel, October 14, 2005, RE: Some Hays Photos. Copyright 2017 Julia Langel. This is a work in progress, so please be patient with errors and omissions!